Ergonomics is the science of fitting workplace conditions and job demands to the capabilities of the working individual. Effective and successful "fits" assure high productivity, avoidance of illness and injury risks, and increased satisfaction among the workforce. 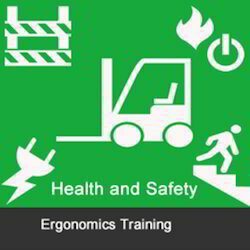 With huge clientele assistance and industrial understanding, we are engaged in offering Ergonomics Training Services. Rendered beneath the supervision of highly able executives, these are largely commended all over the country. Moreover, our ability to alter them as per our patrons’ demands makes these highly well-liked. Work & Wellness is committed to excellence in Occupational health, and well-being in the workplace. We offer cost-effective Ergonomic assessments. Improper work station set up and lack of knowledge about correct body mechanics while working are the factors that causes Repetitive strain injuries at workplace. Office Ergonomics - Individual Ergo analysis, Ergo Awareness Training program, Ergo program Implementation Training, Ergo awareness camp, Ergo assessment of tasks using 4 step method.